There's a new type of paper in the U.S. quilling world... graduated color strips called Exotic that are imported from Australia. Denise Cameron, owner of Custom Quilling, sent me a package to try. I've enjoyed quilling with graduated color strips in the past, but this is the first time the color change appears as a stripe that runs horizontally along the length of the strip, giving a unique effect. The 5/8 inch x 10 inch strips I received were all two-toned except for one that had a third band of color which added a nice bit of interest (upper right flower). The festive color combinations were mostly bold, but there were a few pastels too - light green, pink, and blue. After fringing several strips by hand (I don't have a mechanical fringer, but I've read that a reliable one has just come on the market), I realized it's best to cut toward the widest color stripe so the variation will be more noticeable when the paper is rolled. Fringing aficionados will enjoy mixing colors and combining strips of different widths. By the way, the color is printed on one side of the paper; the reverse and core are white. I made folded leaves to go with my flowers from little rectangles cut from green strips - the color shading gives them a nice look. Exotic strips are available in three widths (3/8", 1/2", 5/8") and come in multi-color packages as well as separate colors. You'll find them at CustomQuilling via the search term: exotic. 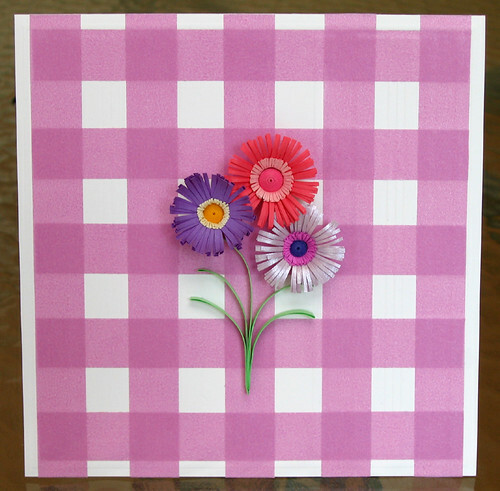 If you've never made fringed flowers, here are a few examples of ways they can be used for card making. 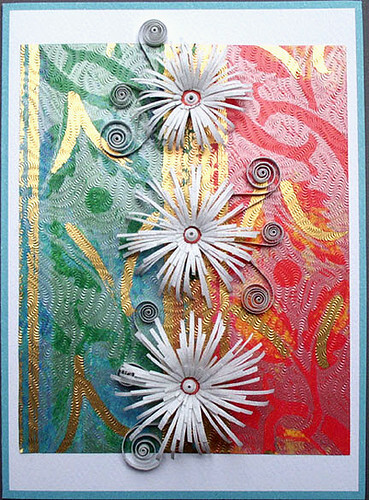 The flowers above are created with two colors rolled together using a slotted quilling tool. After fringing the stacked strips, glue together at one end and add a 1/8 inch x 3 inch strip which will form the center. When the strips are rolled, glue ends in place and fluff the fringe. Sometimes I curve the fringe using a scissors blade as if curling ribbon. See more of my tips on making fringed flowers. The scattered fringed flowers below is the result of cutting a pennant-shaped strip - tutorial at the link. I used a variety of scrolls instead of leaves plus metallic wrapping paper for the background to liven things up. 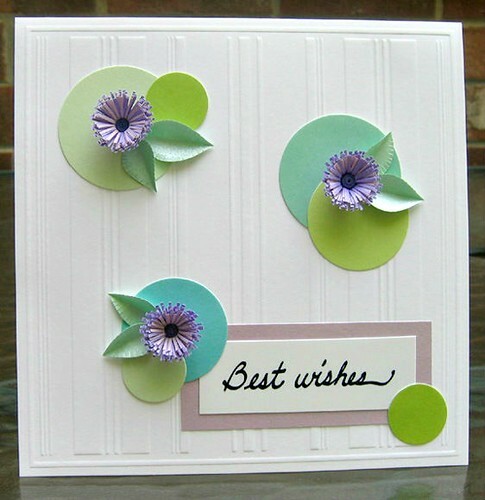 Lastly, here's a card idea from the Spring 2014 issue of CardMaker Magazine. I used washi tape to create a plaid background. You'll also find two fringed flower projects in the All Things Paper book that were made by talented card maker Agnieszka Malyszek. Here's one of the designs - a showstopper frameable flower. 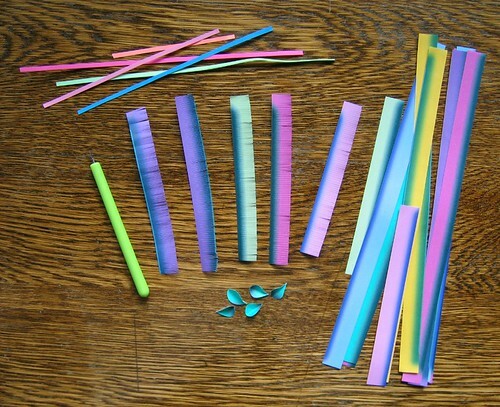 Have fun making fringed flowers... they'll help tide us over until we see real flowers this spring! These strips are beautiful, aren't they! I am lucky to live near the manufacturers and have known about them for a while. I have various packs of them. It's amazing to see overseas buying something exotic from us instead of the other way around. Have lots of fun with them - I know you already are. And thank you for the pennant idea - that card looks great! Wow ! So beautiful cards ! I loved the shaded strips ..
congrats ann on your design going to.print in Cardmaker....the washi tape gives a lovely backdrop to the bright fringed flowers. thanks for the feature on the exotic australian papers. spring isn't far off now for all in the northern hemisphere!! Wonderful projects! Can't wait to give it a try! Graduated colours do give so much more beauty to the flowers. I have always been a huge fan of Agnieszka's neat quilling. Thanks again for all the tips you share Ann. It is a huge help. Thanks so much everyone, I'm glad you enjoyed the post. 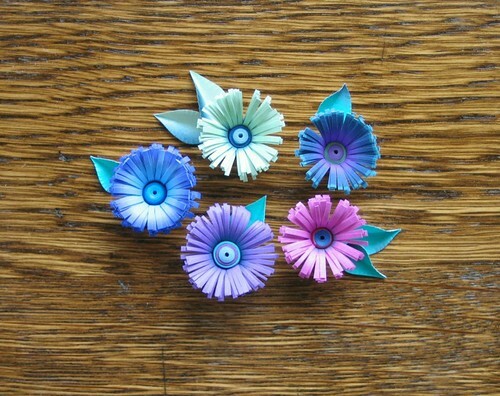 I love paper flowers so when I saw your project on Craft Gossip I thought I better come by and check them out. Love them! thanks for the instructions. Wow! Love these! Thanks for the inspiration! I wonder if it is possible to buy strips with the fringe already cut into it. For the elderly with not so steady hands and poor vision, it would be a godsend. Just love the flowers sooo pretty. no need of exotic strips, you can simply use ink pads to ink the edges to give effects like these.. I love the spider flowers but I would like to know what you mean by pennant-shaped strip (pic please). Thanks Denese. A pennant-shape is an elongated triangle - wide at one end and narrows to a point. If you google pennant, you'll see what I mean. Start to roll from the wide end. The size can be whatever you like... experiment!